The Invictus Group | Regulations – Disruptive Thinking: Is the Community Bank Leverage Ratio Fool’s Gold? 06 Apr Regulations – Disruptive Thinking: Is the Community Bank Leverage Ratio Fool’s Gold? Bank Leverage Ratio Fool’s Gold? Though vague on details, the bill suggests that if a bank maintains a capital level above this requirement, it would be well-capitalized. Community banks would be able to opt into the new ratio, and ignore other capital requirements based on risk weightings. But most banks that select this option may be making a big mistake. It is likely that regulators will choose a ratio of 9 percent or 10 percent. (The House bill that must be reconciled with the Senate Bill called for a regulatory off-ramp for banks that met a 10 percent leverage ratio). We have seen regulators pushing more and more community banks toward a 10 percent minimum for roughly 18 months now. They have been primarily focused on those banks with high CRE and Agricultural concentration ratios and acquisitive banks (in some cases, quietly holding regulatory approval of a deal hostage until acquirers agree to maintain higher capital levels). Whatever number the regulators pick will leave community banks with no option to optimize their capital requirements if they can prove that they can operate safely below it. This will be problematic for banks with concentration levels and unique business models that rely on assets with low risk weightings. 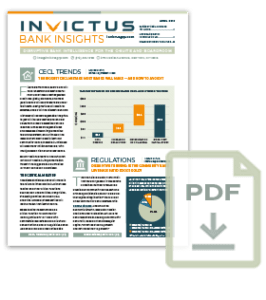 Indeed, an Invictus study found that 82.3 percent of community banks can — and should — safely operate with leverage ratios of 8 percent or lower today (see “Exclusive Study” on page 5 for results). Remember the days when 5 percent was considered enough regulatory capital? Then it became 8 percent, and now it feels like 10 percent will become the norm — unless banks take matters into their own hands. It is already difficult enough to generate a sufficient enough Return on Equity (ROE) for a community bank to justify its existence. Cementing in stone a 9 percent or 10 percent leverage ratio will only make it more difficult — and frankly impossible, for many banks. Community banks must contend with tough headwinds threatening ROE as they transition from a post-crisis recovery cycle to a rising rate environment. As short-term interest rates increase back to normal levels and the Federal Reserve’s policy of quantitative easing unwinds in what we call the “Normalization Period”, they will face new challenges that typical bank analytics cannot predict. Loan growth in most parts of the country has declined, deposits are quickly becoming a problem, both in terms of cost and volume, and there is no low-hanging fruit left to optimize the efficiency ratio through organic means. Many bankers are hopeful that tax reform will change these conditions and spur lending. However, this new surge will have to trump (no pun intended) a Federal Reserve committed to increasing short-term interest rates and reversing QE, which makes it far from a guarantee. While ROE levels will increase significantly with a lower effective tax rate, investors will also demand higher returns (which will further be exacerbated by rising interest rates). 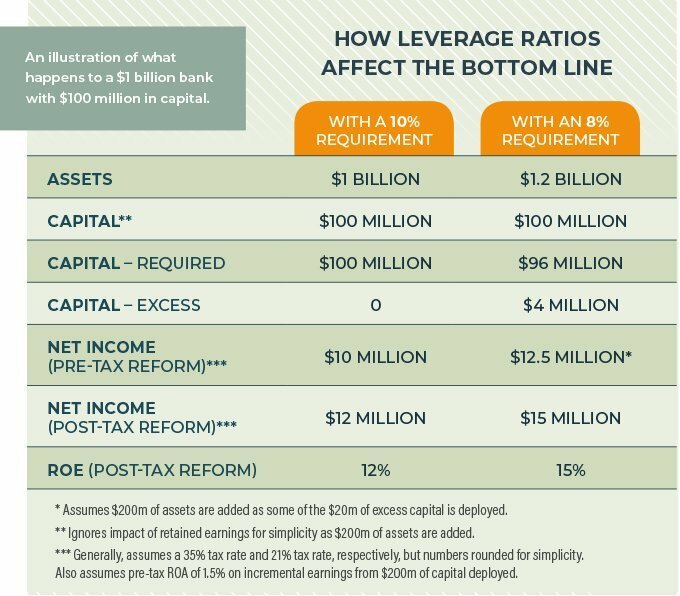 As a result, the cost of capital will significantly increase, and it’s only a matter of time before we return to the days when 15 percent ROE was the expectation, not 10 percent. 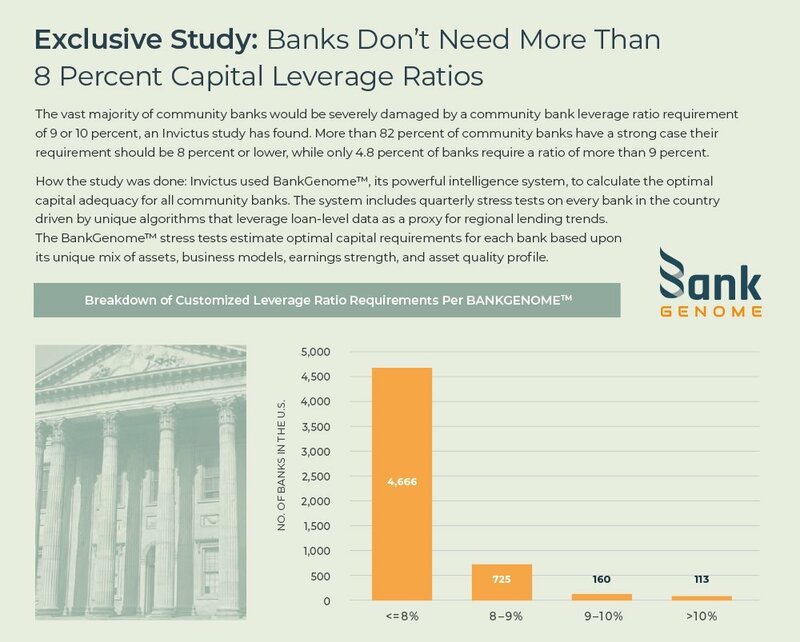 Banks that choose the community bank leverage ratio may have less regulatory scrutiny, and perhaps lower compliance costs. But that will come with a significant price. They may find that they cannot generate sufficient ROE for shareholders, and end up putting their bank up for sale. So, what should bankers do if the new ratio is set at 9 percent or 10 percent? Our opinion: Opt out. Bankers need to take the bull by the horns and calculate what their capital requirements should be based upon their bank’s unique risk profile, risk appetite, business model, and geographic dynamics. They then need to take that analysis to their regulators and fight to make their case. The difference between an 8 percent requirement and 10 percent requirement for a community bank is massive. Consider a $1 billion bank with $100 million of capital and a pre-tax reform ROA of 1 percent. If this bank can provide evidence that it needs only $80 million of capital, not $100 million, then it essentially frees up a whopping $20 million. If that $20 million is leveraged and deployed, it could create $2 million to $4 million of additional earnings. The table on page 4 illustrates the impact. The only way a bank can calculate its own capital requirements in a post-2008 world is with a stress test. At the end of the day, the new definition of capital adequacy is based upon a bank’s ability to withstand another severe downturn like the 2008 Financial Crisis. This is why regulators use the CCAR stress tests to customize capital requirements for the nation’s largest banks. This is why Basel III was created, and why they proposed the creation of a stress capital buffer this month. Think of a stress test as the new calculator. You will need to support your methodology and your assumptions, but the regulators will respect this calculator because it speaks to their holy grail (CCAR). If your calculator shows you only need 8 or even 8.5 percent capital, it is worth fighting for, as our example shows. Most community banks are only running stress tests today because they feel like they must. It’s become a de facto regulatory requirement — especially for banks with CRE or Ag concentrations. What they are missing is that stress testing is not about compliance. It’s about capital adequacy. Those banks that understand this and take that approach will also be the banks that have earned regulatory permission to operate with capital requirements that make more sense for their bank, and not the very expensive safe harbor of 10 percent.